One of the big changes for us in moving from London to Suffolk was acquiring a real garden rather than a back yard. Managing the garden however has been a real challenge. Mostly the garden is winning. Although summer seems to have disappeared, our garden continues to run rampant. I remember back at the end of March when I was dismayed by the volume of weeds, and actually tried wielding a trowel and some garden gloves. This may have had some connection with the imminent arrival of Andy-the-gardener to prune the assorted climbing roses, vines and wisteria making a break for the roof, and my embarrassment at the state of the rest of the garden. 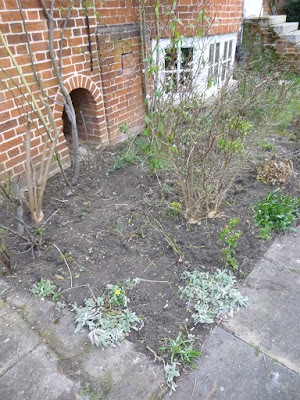 Here’s what it looked like after a couple of hours’ weeding. Note the flattering camera angle, as I try to ignore the part near the steps, where I rang out of time, effort and energy in the face of ground elder. 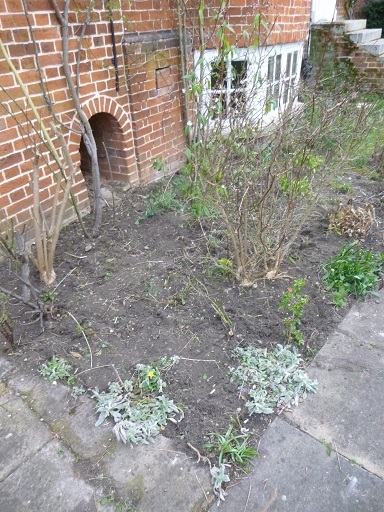 Flower bed afterwards: visible earth! (By the way, in case you were wondering, we were told by the previous owners that the weird little arch is a dog kennel. The strange window that seems to have been eaten up by the flower bed is actually the window for one of the rooms in the basement). Anyway, fast forward four months, and the plants have fought back. At least the bees are happy. And I can promise myself that if the rain would only hold off a bit, I’d go back outside and hoick out more of the undergrowth. did not reveal the name of this plant. Thank you, much appreciated! I did try emailing the photo to my mother, as my fount of gardening knowledge, but although she claimed to have grown them in several past gardens she couldn't remember what they were called either. definitely echinops. The bees love them. Just think of it as a cottage garden. If you want to claim bits back or re-jig let it do it's own thing for a while longer and then potter with it's bare bones in Autumn. Definitely like any advice that involves me leaving well alone until autumn! Have been attacking the paths recently, trying to uncover some of the paving stones & cobbles, while the flower beds do their own thing. I do love cottage gardens and some of the few seeds I got round to planting are things like foxgloves, poppies, nasturtiums, cornflowers and night-scented stock. Was going to say that the plants in the front of the echinops looked like sedums which butterflies would also loe, but on second look they're probably euphorbia [the "flower" stays greeny yellow] in which case be very careful when weeding – the sap is toxic. Love following your blog, by the way! I love the lttle dog kennel, what an unusual feature and how lovely to have windows that open right into your flowerbed! Thank you for being brave and posting about your weeding efforts, we've all got areas like that or much much worse. I often wish that Monty would show us the scrappy bits of his estate for a change! Thanks Sue. 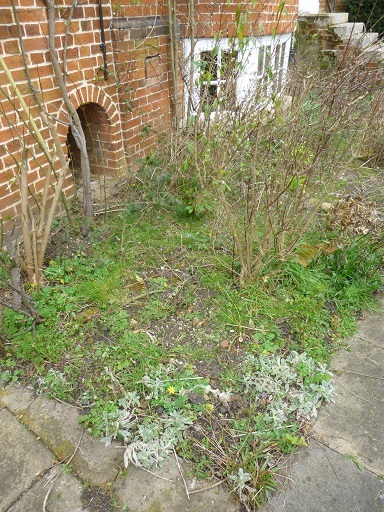 I'm sure I can provide many more photos where the (lack of) weeding wouldn't exactly win RHS medals. I have been fighting ground elder for years now, if I had known what is was I would have nuked the garden and waited a year to start planting… Every tiny bit of root regenerates a plant.